The Royal Jordanian Falcons National Aerobatics Team was founded and established back in 1976 at the behest of his Majesty the late King Hussein Bin Talal (may God bless his soul). It was his Majesty’s intention to promote the Jordanian Family, peace and friendship to the world through the art and science of aviation. The team started with 2 Pitts Special-S2A aircraft and later an additional aircraft was added to the team fleet to perform in a 3 ship formation. Since 1976, the team has performed in many countries throughout the world, such as Al-Ain in the United Arab Emirates, Qatar, Indonesia, the United States, the United Kingdom, France, Italy, Switzerland, Germany, Belgium, Spain, Norway Austria, Luxemburg and Netherlands. 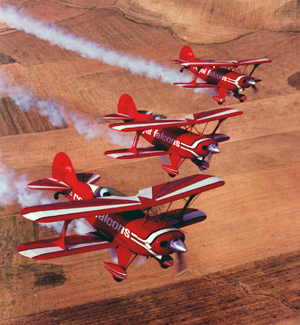 In 1982 and by a Royal decree, four Pitts Special-S2S were purchased and added up to the Royal Jordanian Falcons Fleet which was after performing a display tour in many of the American States. The Royal Jordanian Falcons operated the Pitts Special until 1992 when the whole fleet was replaced by 5 Extra-300 aircraft. The Royal Jordanian Falcons continued performing the task of promoting Jordan throughout the world continents until 2007 when the team purchased 5 new Extra-300L replacing the old Extra-300 midwing. Recently and at the behest of His Majesty King Abdullah II, 5 new Extra-330 LX aircraft were purchased replacing the Royal Jordanian Falcons Fleet.